Is it wrong to resign? 3 pawns for the piece - sometimes to soon! ANU Chess Club member Andrey Bliznyuk steered me in the direction of an alternative, and interesting, chess news source. Chess-news.ru is a Russian website that covers the latest in world chess. Now most of the site is in Russian, which makes it difficult for me to read, but they do have an English translation for most of their news stories. Apparently not all the stories get translated, but looking through the archives, a lot of important ones do. Probably the most important feature of the site is the interviews carried out, and published. Whether it is a language issue, but they seem to be a little more in depth (with the Eastern European players at least), than the ones I have normally seen. Of course the tendency is towards to more sensational aspects of chess (including the ever present personal conflicts), but I guess this is what drives traffic in their direction. Putting my mind to things long ago (well 30 years or so), I'm trying to remember the earliest chess playing program I ever saw. It may have been a version of Sargon on a TRS-80 on display on a Tandy store (possibly at North Rocks Westfield around 1979), or it may have been the chess program you could get for the Microbee in the early 80's. Moving forward a few years, I do remember having a copy of Chessmaster 2000 and Battlechess, although as a serious player I had a preference for Zarkov. I even had a copy of Fritz 1 at one stage, but I can no longer find it. I even thought of writing my own on my Microbee, but as the only programming language I had acces to was BASIC, this proved impractical. The 2011 World Cup started yesterday, and already some players are ready to return home. Unfortunately one of this players is Australian GM Zong Yuan Zhao, who lost 2-0 to Evgeny Tomashevsky. In both games Tomashevsky sacrificed a pawn in the opening (Game 1 Catalan, Game 2 Marshall), but then generated enough play to make up for the shortfall. Justice John Purdy, former Australian Champion, has passed away at the age of 75. Purdy was the son of Cecil Purdy, and won the Australian Championship in 1955 and 1963. He also won the Australian Junior Championship in 1951, and was the winner of the very first Doeberl Cup in 1963. Unlike his father, John chose a career other than chess, and went into law. He eventually became a judge in the Family Court of Australia, retiring in 2005. Here is a game between father and son from the 1960 Australian Championship. One game, one move. Often this is the difference between becoming World Champion and just being 'unlucky'. Not only does it happen under the pressure of over the board chess, but it also happens in the world of CC. When CJS Purdy became the first CC World Champion, he acknowledged that his game against Napolitano was the key game of the event. Reverse the result of the game, and Napolitano would have taken the title. Keith Foster alerted to me to this fact while sending me a suggestion for a future article in Australian Correspondence Chess Quarterly. He pointed out the the decisive mistakes (for both sides) occurred around move 31, with both players missing decisive continuations. 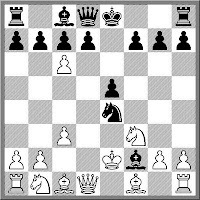 Some further research revealed that this had been noticed around 1998 in an article in Chess Mail, although it was Fritz 5 which made the discovery. Here is the game, without notes, which you can dissect at your leisure. An interesting titbit in the Chessvibes report on the French Championship. The tournament schedule had to be re-arranged after 230 chess clocks were stolen from the venue. The scheduled rest day (for the B,C, and D events) was moved to the day after the theft to allow the organisers to find (or recover) clocks (The report does not say if the clocks were indeed recovered). Very annoying, although not unprecedented. While clocks are probably the most valuable pieces of equipment at a chess tournament, fencing them may turn out to be difficult, in that they have a very specialised use. Previous large scale thefts have usually been pranks or political statements. The Australian Junior in Adelaide a few years back had all the kings stolen between rounds, and while the culprits were never caught, the pieces eventually were. A few years before that, the ANU Open had a different kind of theft, with the large score tables disappearing the night before the first round. After about 45 minutes of examining security tapes, we finally worked out that the thief had cunningly left them in the tournament hall, but had hid them behind some curtains. Overall I'm surprised (but at the same time pleased) that theft of chess equipment isn't that common. When digital clocks first came on the scene, the odd one or two seemed to go missing at the end of a tournament, but even this seems to have stopped. And I've never really seen boards or sets go missing in large numbers either. The 2011 FIDE World Cup starts tomorrow (or in a couple of days), with the 128 participants due to arrive in Khanty-Mansiysk. There are a couple of days of acclimatisation/welcoming ceremonies, with the action getting under way on the 28th of August. Apart from the difficulty in getting there, the venue and the host city should once again be excellent, assuming they match the quality of the 2010 Olympiad. The Oceania representative is GM Zong Yuan Zhao. His first round opponent is 28th seed Evgeny Tomashevsky (Rus), who while being a tough opponent, is probably easier than Magnus Carlsen, who Zhao had to play last time he participated in this event. The tournament website has all the information on the event, and as an added bonus, has a downloadable pairing tree chart, for those of you running your office tipping competition. Luxembourg has won the 2011 Smalls Nations Cup. They finished ahead of hosts Faroe Islands, with Monaco taking the bronze. The 10 team competition only attracted teams from Europe, but it did have a couple of GM's and IM's taking part. I'm not sure what the qualifies a country as a 'small nation' but when the idea was first mooted about 6 or 7 years ago, a country population of less than 1,000,000 was the threshold. I do not know whether they stuck with this or lowered the cut off. There is a nice report on the event from Chessdom including pictures of the tournament. While looking at various news stories (such as "What's on in New London") I came across a brief description of "Accelerated Chess". Basically you get to play 1 capturing move, or 2 non-capturing moves per turn. You can only have one or the other, and I assume that check on the first move should end your turn. I then did a little bit of searching on the game, and found at least one website offering an online version. It is http://www.pathguy.com/chess/Accelera.htm and the site also offers other variants (actually a huge number). The programs on offer aren't that strong (as the author admits) but do provide an opportunity to test out some well known and rare variants. You do need to register to do the test (email address required), but it doesn't cost anything (ignore the stuff asking you to top up your test credits, this is for more advanced testing). Once you have registered and logged in, you can choose to do the free tests, and they have a couple of different levels. Try the FIDE Arbiter Level (if you dare!) as a number of questions on this quiz were also used in the recently completed FIDE Arbiters training course held in Melbourne. The pass mark is 80% (as in the real exam), and the results of the test, including correct/incorrect answers are mailed to you for further analysis. While keeping track of IM Andrew Brown's European chess tour, I came across e2e4 Chess , an English tournament organising company. Brown had played in the Sunningdale International, which was held last week. What was interesting about the tournament (or tournaments) was that the organisers moved away from the 'monster' swiss format, and chose the more European multiple round robin format. There were 12 10 player round robins, with the top 4 offering norm opportunities. This was achieved by spreading the titled/overseas players between the top events, so each RR had 2 GM's or 3 IM's. Of course such a format requires a strong customer base, and the easy access to overseas players (I saw at least 3 Australians in the various events). This would obviously work in the UK or Europe, but it would be somewhat harder to achieve in Australia, Nonetheless it might be just different enough to attract the attention of an ambitious tournament organiser looking the fill a vacancy in the Australian chess scene. Lev Aronian is a sometimes visitor to Canberra, as his girlfriend WIM Arianne Caoili is a PhD student at the Australian National University. Whenever I see Lev I always invite him to play in Street Chess. "Lev" I say, "$5 to enter, and there is a $45 first prize on offer". "Maybe one day" is his usual diplomatic reply. So today at Street Chess, we managed to attract the smallest field for about 3 years. Due to regulars being overseas to play chess, or on holidays, or just deciding to sleep in, we ended up holding an 8 player round robin. And of course just before it finished, Lev and Arianne decided to drop in and play some blitz. So those few who did turn up today at Street Chess got to see some very entertaining 5m v 1m blitz between the current World Blitz Champion and WIM Caoili. (Lev had the 1m btw). I didn't keep track of the score of the match, but I did catch a few of the games. The funniest moment, when Nxf7 was played in the Fried Liver, with the comment "Are you familiar with the games of Paul Morphy?". This almost brought about instant resignation, but the spectators were happily treated to a nice king hunt. I've spent part of today giving some high school students a basic introduction to University Robotics. And I didn't mention chess once! To make up for that oversight here are a couple of videos that combine robots and chess. The first is a large chess board with lego robots as pieces. The video is a littrle long, but it is worth looking at the second half to see how it all works. The second s a robotic fail, where a robot arm fails to complete the task of moving a piece, instead deciding to wipe out part of the board instead. Given the choice of 'Yakety Sax' as the soundtrack, and the voice over, I suspect this may have happened by design rather than by accident. A strange story reached my ears the other day. In a schools event, a player realised he was about to be checkmated and resigned (a rarity at that level!). This apparently did not please a teacher watching the game, who took the resigning player to task, claiming that "he had denied his opponent the honour of winning by checkmate". Certainly the teacher involved was clearly not a chess player (in the 'played in chess tournaments' sense), as chess players understand that resigning is a perfectly valid way of ending the game, and it is often not resigning which shows a lack of respect. And to the players credit, he thought the comments by the teacher (directed at him) were a bit of a joke, even if they weren't intended to be. An interesting take on the World Junior that just finished in India. The argument is that with so many Indian players in both tournaments, they often took points away from other Indian players, rather than from overseas players. Of course this is the trade off when hosting such an event. By allowing so many home players in, the organisers can generate extra income through entry fees (unlike the old days when each country only had a single representative). And to be frank, I'm not sure whether there is a downside to this (unless there is a desire to keep the World Junior and 'elite' event). Of course you will get local v local match-ups, but the top players should make it to the top, regardless of who they have to play. A horde of Australian players are off to Malaysia to play in the 2011 Malaysian Chess Festival. The 8th Dato' Arthur Tan Malaysian Open Chess Championship begins on the 17th August, as does the Ambank Challengers. At the completion of these events the very popular Medeka Teams Championship will be held on the 27th & 28th of August. In the DATMO at least 16 GM's have already entered, which is a pretty good number for a field of 96 players. The number could have been increased by one, but Uzbek GM Dmitry Kayumov has decided to play in the concurrent Seniors event (as have FM Brian Jones and Paul Spiller). I'm not sure what coverage of the event is on offer, but the tournament web page should at least have results. FM Junta Ikeda has had a good result in the 2011 World Junior, defeating GM Jorge Cori in the 11th round of the tournament. He followed this up with a draw with IM Niclas Huschenbeth in the second last round, before going down to IM Upadhyaya Anwesh in the final round. His final score of 7/13 was the best of the Australian contingent, with a PR that matched his current rating. New IM Moulthun Ly finished half a point behind Ikeda (on 50%), while Fedja Zulfic was in the group that scored 4. In the Girls Championship, WIM Emma Guo finished on 5.5, while Savithri Narenthran scored 4. GM Dariusz Swiercz and GM Robert Hovhannisyan tied for first place (I'm assuming Swiercz wins on tie break) while Deysi Cori (sister of Jorge) won the Girls Championship. Full standings can be found here. Peter Svidler has long been one of my favourite players. A cricket loving, Gruenfeld aficionado, what is there not to like. I even went through a period of picking him as the likely winner of various Super GM tournaments, ahead of Anand, Kramnik, Carlsen etc Unfortunately he often came up short in those events, and so I moved my money to safer bets. However one event he has done well in the Russian Championship. He has won it five times, and is currently looking good for a sixth. In the current Russian Super Final he leads by a point with 2 rounds to play, While he has yet to play second placed Alexander Morozevich, I'm pretty confident he will win this one. Today I was introduced to the Halasz Gambit. It was shown to me by Matt Radisich, and starts with 1.e4 e5 2.d4 exd 3.f4! According to Matt, when playing 3.f4! you are supposed to shout 'Halasz! ', which increases the effectiveness of the move. Doing a little research, I found that it dates back to the 19th Century. However for most of its life it didn't seem to have any sort of name, only acquiring the Halasz moniker after being played by a Hungarian CC player of that name in the late 1960's. It turns out that this opening has some significance in the history of Australian Correspondence Chess as well. It was played in the first game finished under auspices of the Correspondence Chess League of Australia. Played in 1929 it was won by G.W. Robertson against James McCrackett. Here it is with notes by Tim Harding, based on original comments by Frank Crowl. In the 1979/80 Australian Championship, Ian Rogers was running away with the tournament, scoring 9 points in the first 10 rounds, and leading the field by 2 points. But in round 11 he met Pat Halpin's Ponziani Opening with a very early piece sacrifice. Although he got full value for it, with 3 pawns in return, it turns out that this reward came too early for it to be of any use. In his notes to the game Rogers notes "Three pawns are not sufficient compensation for a piece in the opening or middlegame unless other factors, such as pawn promotion possibilities, are present". After the early threats to the White king petered out, the extra piece helped White launch the decisive counter attack. Nonetheless this line has been repeated many times since 1980 and it hasn't always favoured White. One option for Black is to decline the immeadiate recapture of the pawn on move 7, and instead try 7 . ... Bb6 with threats of Nf2 keeping White on the back foot just a little longer. Having reported on the early stages of the 2011 Oceania Seniors, I haven't got around to the most important bit ie the winner. Top seed Mirko Rujevic was the comftable winner of the tournament, starting with 5 wins and ending with 2 draws. In second place was Bill Kerr on 5.5/7, including a draw with the winner (a perpetual after Rujevic decided to gain a second queen by promotion). In outright third was FM Brian Jones on 5/7, who started with 2 wins but drew 4 of his last 5 games. Full results from the tournament are here. I've always subscribed to the theory that the FIDE Ratings System is inflationary, and that is why we have so many 2700+ players at the top of the list. However a new study, referred to in this Forbes article, claims that computers have made the top players better, and this is the reason for the rating increase in the top players. As with everything, read it yourself to draw your own conclusions. The Moscow bid for the 2012 Anand v Gelfand World Championship turned out to be the winning one. Chennai had also put in a bid, but I suspect it all came down to $$, especially the size of the prize fund. The official press release from FIDE is here. Well done to all the participants of the FIDE Arbiters Seminar, held at the Box Hill Chess Club over the last 4 days. The seminar, the first ever held in Australia, was organised by the Oceania Chess Confederation (with help from the Box Hill Chess Club) and was sponsored by the Asian Chess Confederation. I was one of the (paid) presenters, along with Gary Bekker and Charles Zworestine. The seminar was over 4 days and was pretty full on, with more than enough material to fill the 7 sessions. The seminar finished with a 3 hour exam, which had a pretty brutal pass mark of 80%. At this stage the exam papers are still to be marked, but as was pointed out (by me) at the end of the course, even if the participants don't all pass, they've still learned as much over 4 days as many arbiters would learn in 10 years. The 2011 British Championship ended in a blaze of publicity, with the issue of the ECF Presidents T-Shirt being te main topic of discussion. ECF President CJ de Mooi was planning to present the tournament prizes in a shirt that read "Some people are gay. Get over it!". The tournament arbiter, Lara Barnes, queried the appropriateness of the shirt and the fun started from there. I'm currently in Melbourne, helping present a FIDE Arbiters Seminar at the Box Hill Chess Club. Alongside the seminar is the Oceania Seniors Championship (as reported yesterday). I've been able to watch a bit of the action, although not much, as the seminar is pretty full on from 9:30 am to 6pm each day. However I did catch the final stages of the game between Bruce Gloistein and Paul Dunn. I'd previously played Bruce in the 2011 Oceania Zonal, and found him quite a tough opponent. In the game below, Dunn seemed to have a complete disdain for his queen side pawns, and indeed gifted 2 of them to his opponent. But to prove that the kingside is still where it is at, a capture on h2 to open the h file, and a bishop sitting on g3, signalled trouble for Gloistein. Possibly not understanding the idea behind Rf6, Gloistein retreated his bishop to c1, but once the Black queen moved to f7 it was pretty much all over. A good field of 30 players has fronted up for the 2011 Oceania Seniors Championship. The tournament favourites are IM Mirko Rujevic, former Australian Champion Doug Hamilton, and current Oceania Chess Confederation President FM Brian Jones.All three players managed to win their first round, although Phil Viner was upset by Nigel Cooper, and Frank Hutchings was beaten by Celestino Fulgenzi. 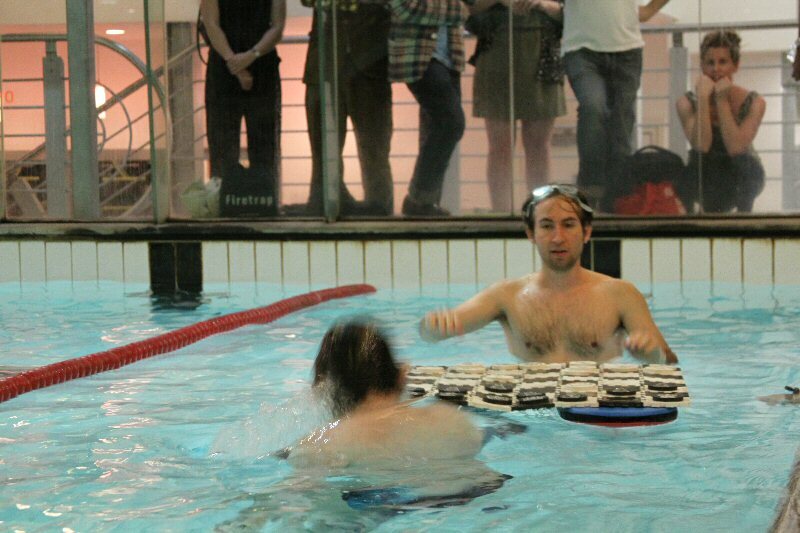 Apparently the 19th Mind Sports Olympiad sees the addition of a new chess variant, Diving Chess. It is played in a pool, with a floating board, and you are required to stay under water for the duration of your move (by which I assume you think while under water, and surface to play your move). Much like Chess Boxing, it combines both mental and physical aspects, and like Chess Boxing, may result in brain damage. The press release covering both Diving Chess and the rest of the Mind Sports Olympiad can be found at this link. I recently completed the following CC game, in which my opponent hit me with quite a strong novelty. Up until move 10 we had been following some previous games (not that many actually), an I assumed that after 10 ... Nb4 he would have to deal with threat of Nc2+, when I would recapture in d5. Instead he calmly played 11.dxc6 and after 11. ... Nc2+ 12.Kf1 Nxa1 13.Nd4! revealed the point behind the sacrifice. I decided to castle, but White has an advantage no matter what Black does. Unfortunately for my opponent he overstepped the time limit (7 days per move) soon after, and I flagged him. But if you play the English Opening, feel free to use this novelty if the opportunity arises (not that it is mine to give away). The 2011 World Junior Championships have started today in Chennai, India. Representing Australia are FM Moulthun Ly, FM Junta Ikeda, Fedja Zulfic, WIM Emma Guo and Savithri Narenthren. The website is http://www.wjcc2011.org/ although I'm having difficulty seeing the list of participants, while the live game coverage is showing the usual first round problems. Hopefully these problems will be fixed shortly and I can bring some up to date results. The 2011 British Championship has been running for the last week, but I haven't been paying much attention until now. This year the organisers managed to attract both Michael Adams and Nigel Short, adding an extra level of strength above the usual top band of GM's. At the first break in the tournament, Adams, Short and Jones share the lead with 5/6. In tonight's round Short plays Jones, while Adams plays Simon Williams. The top games are all being broadcast live at http://britishchess2011.com/live_games.htm, and will prove a sufficient replacement for Tour de France coverage! Alongside the Championship are a number of other events, including the Seniors. Playing in this event are well known arbiter Stewart Reuban, as well as former ANU Chess Club member Pete Morriss. The tournament home page is http://britishchess2011.com/ and it contains a huge amount of information.